This character was designed by Mike for our Design A Character Competition, and was illustrated by Sara Dunkerton. 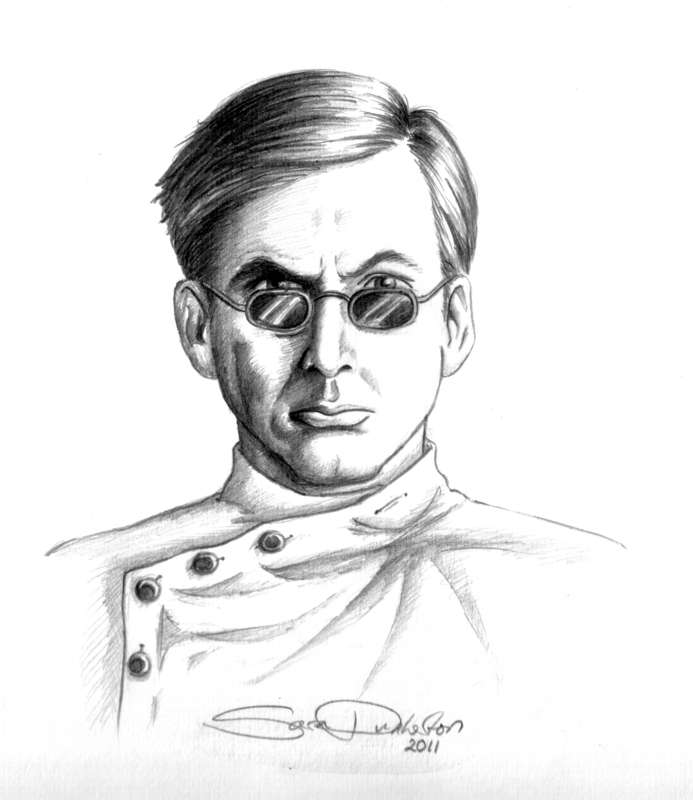 Since Promethea has become a center of learning and progress, scientist from all over Europe has flocked to Frankenstein’s domain and Sitorius has been one of them. The tall and angular man in his mid-thirties has a keen intellect and piercing eyes which are usually hidden beneath dark glasses. He usually wears his brown hair shortly cropped and is clean shaven. But aside from that he doesn’t worry that much about his looks or fashion that much. 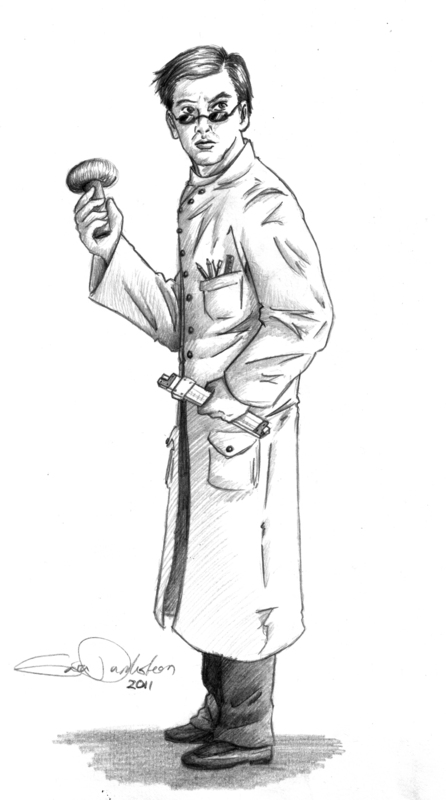 He’s perfectly comfortable wearing a rumpled and stained lab coat most of the time. Back at the university in Berlin his colleagues have mocked his wild theories, but in Promethea the electrical engineer not only found like-minded colleagues but also proper funding and support. In the recent years he has intensified his studies on the use and applications of electrical forces. Eventually he started to exchange letters with fellow scientist Nikola Tesla who was working in the same field. Johann felt he was nearing a breakthrough in his research when suddenly something totally unexpected happened. He fell in love. Rebeka was a simple servant girl who had been working for him for several months now, but suddenly he felt he developed feelings for her. He started to spend more time with her, explain his work to her in the simplest terms and showed interest in her daily toil. She told him about the life of the simple folk, something he had been totally oblivious about. Even though he was fascinated by the medical advances made by Frankenstein, he found the Harvest an appalling practice. Fearing that his beloved may fall victim to the Harvest, he decided to secretly get in touch with the Resistance he had heard about. Perhaps his scientific works may even help their cause. Nikola Tesla – While the (in)famous Kroation scientist is living in the United States, Johann counts him among one of his closer contacts. Although both men are working in the same area of expertise they never saw each other as competitors. Johann even tried to convince Nikola to come to Promethea several times, hoping they could work on a project together, but Nikola has been reluctant so far. Bela Ionescu – Bela Ienescu is a Promethean industrialist who owns a tools factory not too far from Johann’s laboratory. Bela and Johann first met when Johann was looking for a factory that could build certain special apparatus for his laboratory. The two man became fast friends and often meet over a glass of wine to talk about the latest advances in engineering. Bela is pro-revolutionary and has secretly supported the Resistance from time to time, but Johann is unaware of this. A slide rule produced by Keuffel and Esser Co. of New York which was a gift of his family when he left for Promethea, a lab coat with several pockets containing small electrical parts, a pair of sunglasses, a small case containing various screwdrivers and other tools, and a walking stick that he carries around as a form of self-defense if necessary.